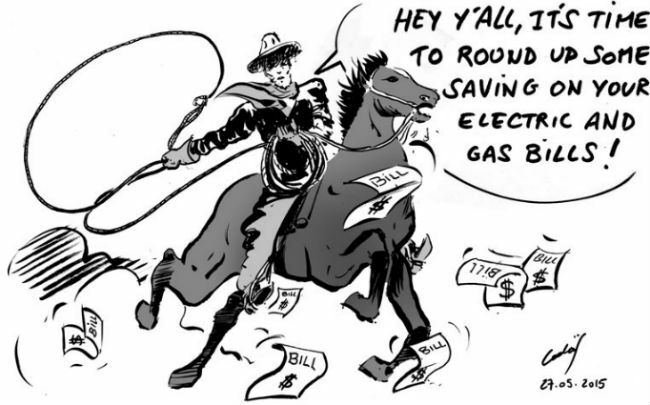 How is electricity priced in Texas? What are all these charges on my bill? In this section we decode electricity prices in Texas and provide you with all of the information you need to be an educated energy consumer. Deregulation in Texas has provided consumers with a lot of choice, both in terms of who supplies their electricity as well as what type of price they want to pay. Between choosing a fixed, variable, indexed, or prepaid plan, electricity customers in Texas have plenty of options! Fixed prices for electricity lock you in to a rate that will not change over the duration of the contract. Some Texas REPs offer fixed rates for as short a time as three months, but most tend to offer fixed rate contracts at 12 to 24 month contracts. The price stability that they offer provides you with peace of mind and allows you to predict and budget for your monthly bills. However, most of the time customers will be required to pay an early termination fee should they change their mind about the contract. Variable prices change on a monthly basis. Their main advantage is flexibility - you can switch plans or suppliers at any point in time without having to worry about early termination fees. However, variable prices can also change quite dramatically from month to month, and many customers report nasty surprises on their bills. Find out more about why we don't recommend variable rates. Indexed prices are similar to variable prices, in that they change from month to month. However, whereas variable prices can be changed at the retail electric provider's discretion, indexed prices are set by a mathematical formula that is pegged to an energy index. Are indexed prices a better option than variable prices? Find out more about the pros and cons of indexed prices in Texas. Most Texas retail electric providers require customers to allow them to perform a credit check, and/or require a security deposit from customers whose credit history is not satisfactory. Customers with no/poor credit history, or customers who cannot pay a security deposit can still receive electricity, by going for a prepaid electricity plan. This is a "pay-as-you-go" option for electricity: customers purchase their power ahead of time in blocks. While this is also a flexible option, customers on prepaid plans usually have to pay higher rates. Budget billing isn't a price option, but more of an additional feature that you may be able to incorporate into your existing (fixed-rate) plan. With budget billing, total annual consumption is estimated and divided into 11 or 12 equal amounts, so that you pay the exact same price every month, regardless of how much power you have consumed. Once a year this amount is balanced, and the monthly amount adjusted if necessary. Before you sign a contract for your power supply in Texas, your chosen REP should have provided you with a Texas Electricity Facts Label (EFL). This is a standardized format information sheet about your chosen plan that outlines important information about contract terms, prices, power generation sources and emissions levels. The Public Utilities Commission (PUC) requires REPs to prepare an EFL for each electricity plan they offer.